Apparently there are parts of the country that consider iced tea only a summertime beverage. 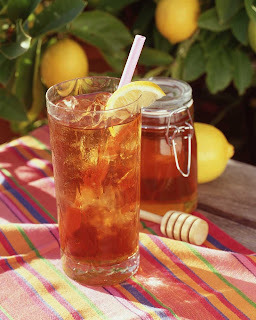 The Nectar of the South needs no monthly designation, but, if we were the types to pay attention to such things, then it should be noted that June is Iced Tea Month. Down here, of course, we're speaking only of sweet tea -- not "sweetened tea" as the English teachers would try to have us say it, but "sweet tea." You CANNOT add sugar to cold tea and have it taste right. You will get a glump of sugar in the bottom of your glass, and that's nasty. Restaurants (and horrid banquet caterers) that force their guests to dump sugar into cold, unsweetened tea ought to be put out of business. Add the sweetener when the tea is freshly brewed, and the result is an evenly sweetened pitcher of tea. Good things happen in brew time. Yeah, yeah, the box says let the tea bags steep 5 minutes -- almost as though some brewmeister squad is going to fine you for letting the teabags sit in water longer than that. Coffeemakers rule. If you've got a drip-coffeemaker, then putting the bags in the basket where your coffee/filter would go and brew away. Water running across and through the tea leaves gives a much more consistent brew and keeps you from the dreaded curse of weak tea. You can sweeten with things other than sugar. There are 300 kinds of honey, the National Honey Board reminds us. Depending on the type of flowers the bees happen to be working, you can get anything from lavender honey to the common clover. Suggested pairing: Wildflower honey. Wildflower honey is amber to dark amber in color with mild floral overtones. Extremely versatile, it is delicious in fruit and vegetable salad dressings, excellent in baked goods and makes a delicious table honey. Clover honey may also be substituted for wildflower. In large heat-proof pitcher, pour boiling water over mint and tea bags. Whisk in honey. Let steep 5 minutes (seet the note above if you want stronger tea). Remove tea bags; cool. Refrigerate until ready to serve. To serve, pour over ice (We'll leave that in there for folks born north of Kentucky). Suggested pairing: Raspberry honey. Raspberry honey is light amber in color with a mellow, smooth flavor and unique raspberry finish. This sweet honey pairs well with vanilla flavors, champagne, chocolate and with fresh fruit, such as pears and peaches. 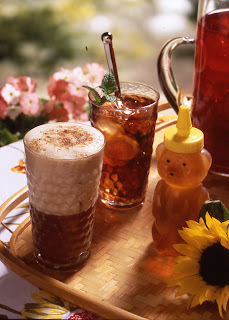 If raspberry honey is unavailable, clover honey may also be used. In a large, heat-proof pitcher, whisk together all ingredients until thoroughly combined and honey dissolves. Chill until ready to serve. Pour over ice to serve. Suggested pairing: Orange blossom honey. Orange blossom honey is a white to extra light amber honey with a pronounced aroma of orange blossoms. It has a sweet, fruity taste and is a great table honey. Orange blossom honey also excels in fruit and vegetable salad dressings, and in marinades for fish and poultry. For concentrate, place tea bags in medium bowl. Add boiling water and steep 10 minutes. Remove tea bags. Add honey and mint; mix well. Mix fruit juices in 1-quart container. Add tea mixture and refrigerate until ready to use. For tea, fill 12-ounce glass with ice cubes. Add 1/2 cup each concentrate and fill glass with carbonated water.Serving Suggestions:Garnish with a pineapple spear and mint sprig.